Nepal as a Destination of Yoga Tourism - What should you expect? The beautiful Himalayas of Nepal, breath of fresh air and the historical facts such as Gautam Buddha born in Nepal has always presented the country as a land of spirituality. And due to this in recent times, Nepal has been one of the top destinations in the world for Yoga Tourism. Yoga tourism refers to celebrating your destination with yoga. Yoga has been practiced in Nepal and India for centuries. Yoga offers relaxation and wellbeing of the all 3 aspects of human life – body, mind and soul. Yoga doesn’t involve rigorous training like working out in the gym, in fact all you need is your own body, and yet it’s marvelous how amazing it makes you feel. Just imagine waking up to the view of an amazing sunrise from between the gigantic mountains and what’s more is you can do yoga on top of a hill with the beautiful sight in front of you. In the recent years various travel agencies in Nepal are offering yoga tour, which takes you to various places across Nepal such as Pokhara, Kathmandu, Lumbini, etc, all in their own rights amazing and perfect place to do some yoga. But you need not necessarily bother yourself with such nifty arrangements. You can simply enjoy the environment and do some yoga breathing in the fresh air. Nepal has always been the destination for foreigners and tourists especially from the west coming in to seek peace and relaxation. If you’ve watched the marvel movie Dr. Strange, you must remember Dr. Strange (played by Benedict Cumberbatch) coming to Nepal in order to heal. The movie is of course a fantasy and you won’t be gaining such super powers, but the healing part remains accurate. If you’re looking to find something different in life, whether it is some definite purpose or just some peace, Himalayas of Nepal is definitely a perfect place for you. In the recent times, the purpose of travel might have differed, however, what you can attain remains the same. Yoga in particular does have several benefits to make your stay easier in Nepal. Nepal is full of adventure. And if you’re looking to be involved in some adventurous activities, yoga will definitely help you stretch and soothe your muscles and prepare you for the whole day of rigorous and exciting activities. Whether you’re trekking through Manang and Mustang at the lap of Annapurna range or going on a 15 hour drive across remote villages to see the majestic Rara lake, you will need to be prepared both physically and mentally. And, yoga will definitely help you keep your muscles and mind set ready. While exciting, these paths are exhausting and it will all come down to your will power. Surely, you do not need any excuse to do yoga or just travel Nepal without any yoga. However, yoga will definitely help you open to embrace the positive energy the fresh air from the mountains has to offer. Upon celebrating your Nepal visit with Yoga, you will definitely be coming back to experience more of the same. Looking for some yoga trips in Nepal? 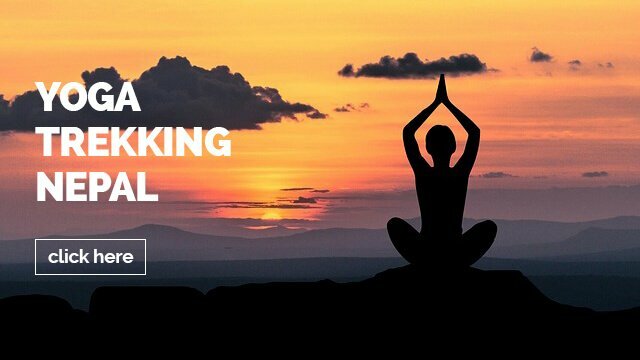 Here we have listed three popular yoga trekking trips from one of our travel partners in Nepal if you are looking for some yoga travel inspiration.